July 29, 2013, a sperm whale was stranded on Tershelling, a northern island in the Netherlands. There was a rescue attempt, but unfortunately the whale died. A young adult at 13.5 meters was taken for a necropsy at the port of Harlington. The sperm whale had plastic in its stomach, an increasing common phenomenon say researchers at the Biodiversity Centre Naturalis. In March of last year, a 10 meter long sperm whale washed up on Spain’s South Coast. This whale had swallowed 59 different plastic items totaling over 37 pounds. Most of this plastic consisted of transparent sheeting used to build greenhouses in Almeria and Grenada for the purpose of tomatoes for the European market. The rest was plastic bags, nine meters of rope, two stretches of hosepipe, two small flower pots, and a plastic spray canister. Cause of death was intestinal blockage. Baleen whales suffer the same fate, not for the fact trash resembles their food, but because they gulp large amounts of water when feeding. In August 2000, a Bryde’s whale was stranded near Cairns, Australia. The stomach was found to be tightly packed with six square meters of plastic rubbish, including supermarket bags, food packages, and fragments of trash bags. 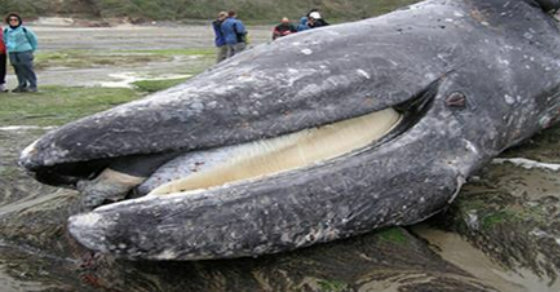 In April 2010, a gray whale that died after stranding itself on a west Seattle beach was found to have more than 20 plastic bags, small towels, surgical gloves, plastic pieces, duct tape, a pair of sweat pants, and a golf ball, not to mention other garbage contained in its stomach. Plastic is not digestible, and once it finds its way into the intestines, accumulates and clogs the intestines. 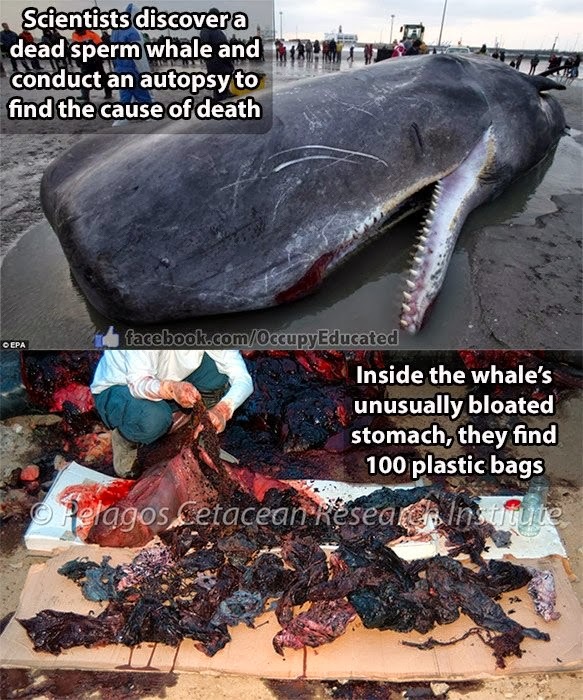 For some whales, the plastic does not kill the animal directly, but cause malnutrition and disease, which leads to unnecessary suffering until death.Whales are not the only victims to our trash. It is estimated that over one million birds and 100,000 marine mammals die each year from plastic debris. In September 2009, photographs of albatross chicks on Midway Atoll were brought to the public’s eye. These nesting chicks were fed bellies full of plastic by their parents who soar over vastly polluted oceans collecting what looks to them to be food. This diet of human trash kills tens of thousands of albatross chicks each year on Midway because of starvation, toxicity, and choking. We can all do our part by limiting our use of plastic products such as shopping bags, party balloons, straws, and plastic bottles. Be a frugal shopper and recycle!r of sweat pants, and a golf ball, not to mention other garbage contained in its stomach. Plastic is not digestible, and once it finds its way into the intestines, accumulates and clogs the intestines. For some whales, the plastic does not kill the animal directly, but cause malnutrition and disease, which leads to unnecessary suffering until death.